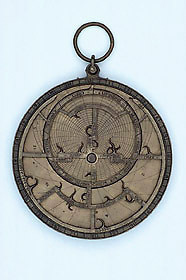 This instrument is typical of the astrolabes of the French maker Jean Fusoris, who established in Paris the earliest commercial workshop of which we have any record. The rete in particular is in his compact and elegant style. Astrolabe plates are made for particular latitudes. One of the plates of this example does not have the latitude value recorded as a number, which is usual; instead it is marked as being for use in Paris.